This is so cute .3. Guinea Pigs Forever! Everyone who has ever had a guinea piggy can confirm it´s a brilliant picture! We humans want us to do or someone to do what we want. But,they do not use the sense to do.Instead, they use the sense to live and enjoy the life that God created. If anyone read my comment, thank me,because it's exiciting. Cute, lovely, beautiful, furry, cuddly, awesome, great, amazing. Actually I've got a guinea pig! I want to go to the guinea pig races! This is simply amazing and beautiful and so guinea-pig filled. I once had a dream that I had a bunch of guinea pigs at a large table. And there was a track around, and they just walked around, looking for treats. I found this pic ages ago on a Bing search! So glad I finally can praise the original artist! OOOOOOOOOOOOOOOOO MMMMMMMMMMMMMMMMMMMMMMM GGGGGGGGGGGGGGGGG this is so fudgeing cute. Lol lazy piggies, there so cute! 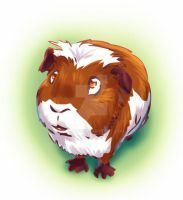 Did you just make up the guineapig designs because 1 looks EXACTLY. 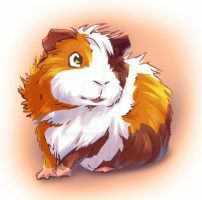 The same as my guinea pig pepper, if you like I could show you a picture! Oh and great art! Haha, number 1 was my first guinea pig, Comet. He had a little comet that started at his feet and went across his shoulder. He was a bit of a runt, but such a lovely cavy. Oh wow! Aside from her floppy ears, she looks SO much like Comet did! That's astonishing! You know you should market this - I just showed 3 people, and they all want a mug with this on... So do I! I just realised the print was deactivated! Sorry about that, if you'd like the mug, the prints are available again. IT CAME! I'm really pleased with it, thank you so much! Brilliant! What a good picture. My money's on number 6! I love it! it's so good! Thst's cute!! ur making it into a mug u say.... Well that's a good Idea!!!!!!! So cute! Number 4 looks like my guinea pig. 1: Why am I here again? Aw 6 is so cute! GO SIX YOU CAN DO IT! I think 3 is going to win. hahaha This is exactly how a guinea pig race goes...it DOESN'T!